The Calliope Piano Trio performed on Show 334 in Boston, MA on March 12, 2017. 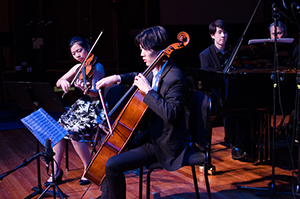 The Calliope Trio is comprised of Karisa Chiu (violin), 17, Nathan Mo (cello), 18, and Andrew Guo (piano), 18. All members of the Music Institute of Chicago Academy, the trio has been coached by Tatyana Stepanova and Paul Vanderwerf. In 2016, the trio was named the overall open division winner of the Discover National Chamber Music Competition and was a semifinalist in the Fischoff National National Chamber Music Competition. They were also bronze medalists in Junior Strings division of the 2016 M-Prize International Chamber Arts Competition. The word “calliope” means “beautiful voice” in Greek and reflects the group’s mission of creating a perfectly unified voice that will touch an audience with its beauty.